The latest Newsletter revealed some sweet upcoming nerd items. First off, watch the "Indiana Jones and Sideshow Collectibles" movie. Shows a glimpse of what's to come and a Harrison Ford face model prototype. Not bad actually. Most of the times the human heads don't look like the actors at all. Then the "Life Size AvP Requiem Bust". Super detailed, full image coming soon. The "Legendary Scale Bust of The Hulk". Looks promising, full image coming soon. 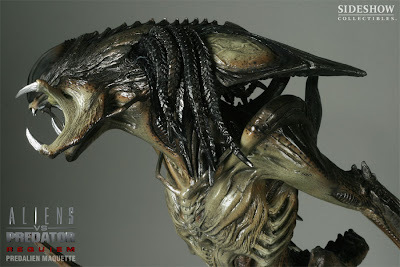 And the fantastic looking "PredAlien Maquette". 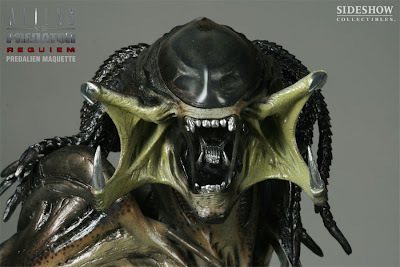 When I first heard about the PredAlien I thought "Oh great, another crappy mutant type just like in Alien 4". Then I tried to avoid the official image from the movie (I hate spoilers), but then I ended up seeing it anyway thanks to a Flash banner (thanks Dark Horizons...). I wasn't very convinced though, maybe it was just the picture or the lighting in the movie sucked. But then I saw these Sideshow maquette images and I like it a lot! I hated AvP, but surprisingly I actually like that design.